An automatic wheel washer was recently installed for Ulan Coal Mines near Mudgee in New South Wales. 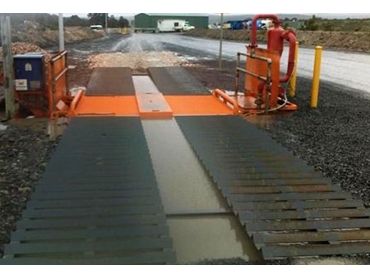 Supplied by Accuweigh ’s Newcastle branch, the automatic wheel washer was installed to eliminate potential track-out onto public roads as part of Ulan Coal’s Duty of Care program. Accuweigh’s AccuWash automatic wheel washer is designed to thoroughly clean the wheels, tyres and underbodies of vehicles without requiring the services of an operator. The wheel wash cycle is initiated by vehicles tripping a mechanical switch as they enter the washing bay and shaker grids either side of the wash bay assist with the removal of heavy clays from vehicles. The AccuWash automatic wheel washer features an automatic sludge scraper to remove mud, clay and organic material from the water holding tank during every wash cycle. The sludge is discharged into an external collections bin which is easily removed by a forklift or end loader. To further improve quality of the recycled water used by the automatic wheel washer, a hydrocyclone centrifugal separator removes fine silt, sand and dissolved solids to significantly washing performance while also eliminating potential pitting of vehicle paintwork caused by suspended particles under high pump pressures. Accuweigh’s eight branches across mainland states are staffed by fully trained and experienced professionals to provide superior product support on all wheel washing applications.